Subject: The (Mini) Details of Dr H: Now Building: Malignant Plaguecaster / Now Painting: Inceptors. No progress on either the Inceptors or Mr plaguecaster. But I have made a start on Christmas presents. To be standing on a ruined and burning wooden tower (I have an LED candle to put to use). But first I had to fix his arm (excess and dried-out glue); re-attached and gap filled. And then I strung his bow. I have the perfect wire for scale bows, from some motor or other. Fine as hair, but will cut you before snapping, if you're not careful. Over the notch at the bottom and wrapped around there, plus superglue. Straightened the bow (metal model) to pull the wire tight. I have a dislike of scale bows without strings. I can't help it. The "elements" Intercessor squad are on the way to their new owner. First good, high-value sale. Subject: Re:The (Mini) Details of Dr H: Now Building: Malignant Plaguecaster / Now Painting: Inceptors. Excellent bowstring, adds so much to the model to have an actual string on the model, great work so far on the inceptors and the plaguecaster. I agree with you on bowstrings; without a string, a bow is just a stick. Looks good, sir! 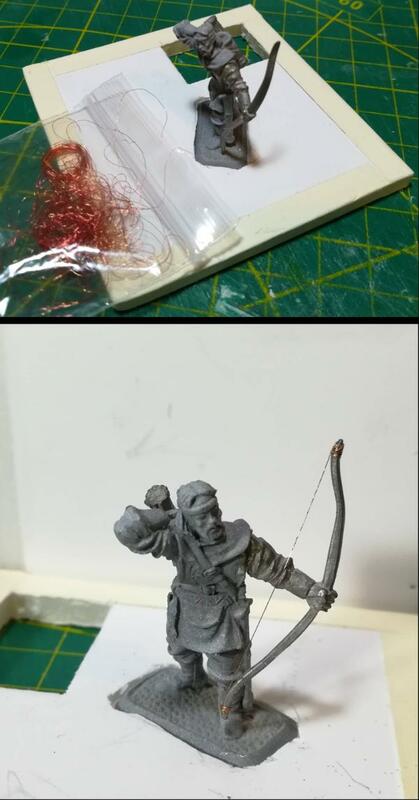 Nice idea, but won't that bowstring cut your brush up as you try to paint it? As is the way when trying something new and learning how to do something while doing it, I've not been keeping you up to date. So today you get a 2-for-1 deal update. Thanks Graven'. It's a relief that someone will actually pay what I'm asking, so don't you all wait for the prices to drop. Thanks Gits'. If I didn't have a wire like this I'd probably use some hair. Just find someone with suitable length and thickness and borrow a few strands. All that wire you see in the baggie in that photo came from one motor... from something... So if something motorised breaks, strip it down. Just another "it'll be useful one day" things. Thanks CK. I wouldn't expect it to damage a brush. I'd just run the brush along the length, once each side and it should be done. It's as smooth and fine as human hair (hence my suggestion above). 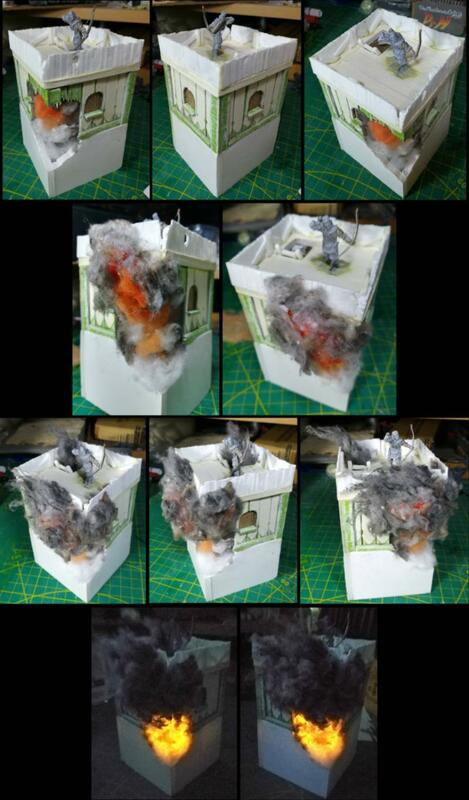 The plan here is to just be building the top of a tower and integrating it into a display base/plinth. As Bard the bowman is all about shooting dragons with arrows, the tower needs some fire damage, and I just so happen to have some LED candles. Step one, build a box. Step two, build rough shape of tower on top of box. Step 3, install LED candle into bottom of box. Step 4, add wool. Initial covering is a cylinder of stuffing-like material (I think for clothing padding). This allows the light to fill the interior of what will become the smoke plume. Step 7, Add planking to the tower and work towards filling it out to the thickness of the box. Step 8, Add a ladder to show how Bard would get to the top of said tower. This will be mostly obscured by more smoke. Then some actual textures get added in the shape of some strips of thin card (scored for wood texture). I'll fill around his feet with putty to hide his base and make the planks complete. Next job is to build some of the top of the tower and finish the structure of the lower tower and merge that with the box. Thanks aku-chan. See below for fire progress. Thanks CC. It's nice when you've kept something and have no idea what you can use it for, and then later a problem emerges that it perfectly solves. I've filled in the gaps and around Bard's feet with putty. The planks should look continuous under him once painted. It also turns out that sections from my Hut kit (2 still available in my Etsy shop ) when cut in half, make nice low fences, and with the end planks removed from each they are the perfect length for each side of the tower. And the smoke and fire has been added. Red inside and black/grey around that. You'll notice that the glue is still wet here and so the smoke will get teased out a bit more once dry. Also, the smoke will be blackened at the extremes during the painting, but only on a surface level. The glow is not terribly noticeable in well lit conditions, but does the job. Just need to paper over the bottom and then it can be painted. Subject: Re:The (Mini) Details of Dr H: Now Building: Christmas presents / Now Painting: Christmas presents. Painting has started on the tower. One other project is nearly finished building and will need minimal painting. Present number 3 has been started. First the tower to show. Bard is going to be colourful as the focus of this piece, the rest us just a backdrop. 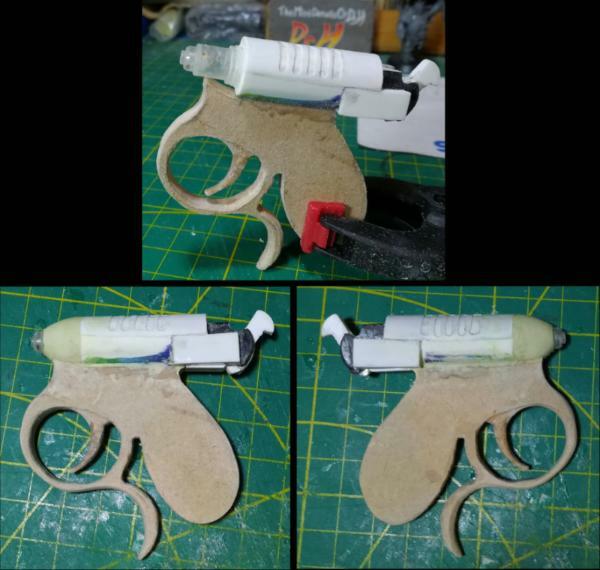 Used MDF as a base for the handle and trigger bits as it'll need a bit more strength than plasticard would manage. That colourful piece is part of an old pen lid. Was just the right thickness. I'm guessing you mean other than a firearm? Is that going to become the noisy cricket from men in black, by any chance? Also, love the tower, nice effects work! "He was already dead when I killed him!" Ahh, you're right, that does look the noisy cricket. The smoke has turned out really nicely, it's going to look amazing when it is all finished! The tower with Bard is outstanding. Great, subtle work dude. Thanks Red'. Well you got the size about right, and probably the inspiration for the original. nil points. MT. You have the genre right (sci-fi), but not the film. nil points. Dark Apostle' wins the internet... point. Spend it wisely. Yes, the Noisy Cricket. I nearly went for the neuraliser but felt I'd want that to at least pop up, maybe next time. MT2, that's because it is. Thanks CC. I hope so. Another earring display box. The previous one is full, so a new box is required for more earrings to be presents. Rather than making 3D designs with my 3D printing pen, I thought I'd draw directly on the clear box. To get the swirls at least roughly the correct sizes I used circles of paper. Then it was just freehanded swirls about the place. As a distraction from or to directly hide the joins in the box, it does the job. I'd have preferred to have them perfectly symmetrical on each side, but that went out the window on the first swirl, so embracing the asymmetry. Deliberately didn't attempt to get any lines smooth as that's virtually impossible with one of these pens and with it melting to the clear plastic you only get one go and one mistake would destroy the whole thing (and I don't have any more clear plastic). Embracing the rough look. And yes, progress on the Noisy Cricket. Found the perfect piece of plastic for creating the point out of (from a soap dispenser). Gives the steps at the point where the tip extends from. Then just putty up the sides for that (holes to be drilled). 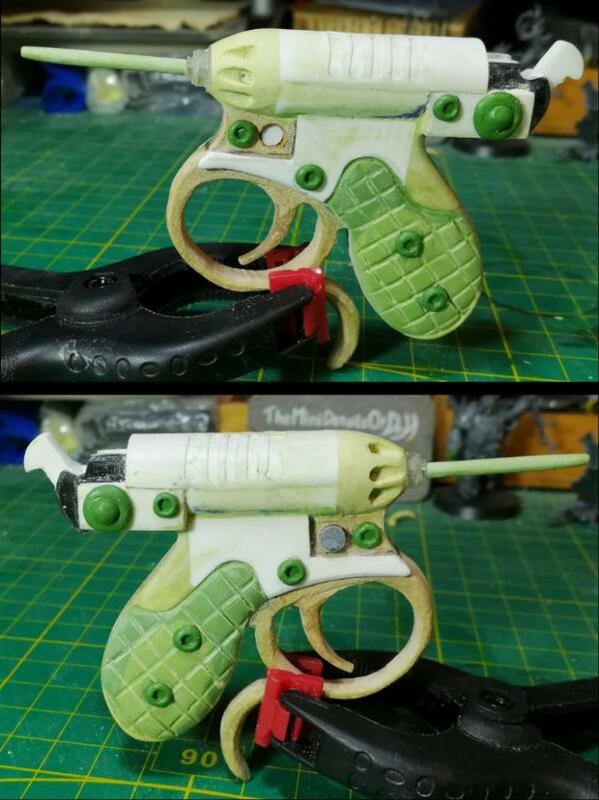 Grip and bits to sculpt and the tip to add (last as I'd break it off if I added it sooner). Good trick with the paper circles. Asymmetry and rough style is definitely the right move Is that silvery plastic from the pen, or have you painted? I recognized that gun even without reading the name. Nicely done Cam. Spot on! Subject: The (Mini) Details of Dr H: Now Building: Christmas presents / Now Painting: Christmas presents. Good to hear Gits'. Thanks. Thanks CK. Yeah, the existence and intention of this blog (as opposed to my "army" blog) has led to a great deal of diversifying in my work. The same methods, but with different directions. Just a matter of making sure everything is smooth and then it'll be painting time. And the wood is done on Bard's tower. Windows too (these were nearly boarded up, with shutters, opened, broken, any combination of the above, but finally painted). Now to airbrush some blackening from the smoke/fire, before painting Bard himself. Your leaded windows are superb. I had to do a double-take and see if you added mesh. Nice Cricket too, btw. I must confess I had no idea what the noisy cricket was until Men in Black was mentioned, and then I still had no idea because I haven't seen the film in years! Great job on it though, maybe I need to re-watch MiB. Bard's tower is looking brilliant already, the wood detailing is really lovely and the leaded windows are lovely. Sorry Dr. H. Sometimes I go through so many blogs in one go I lose all track of where I am.